Layang Layang atoll offers breathtaking underwater scenary along with numerous pelagics. 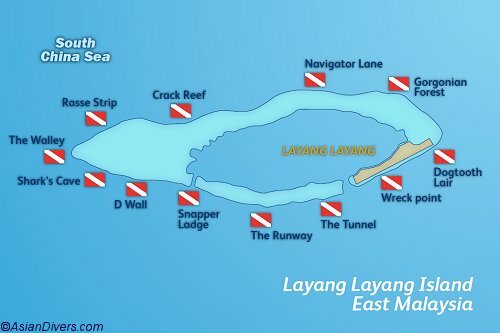 Layang Layang offers superb diving and underwater scenary. This is one of the rare places on earth where one can dive with hammerhead sharks. Situated northwest of Kota Kinabalu and adrift in the South China Sea, this island of shallow reef, �Layang Layang�, is a beautiful island resort and a treasure to the Borneo banks. This charming resort was built to look like a traditional longhouse but with modern amenities that offer world class diving opportunities. The dive spots near the resort have steep walls and picturesque underwater paradise. Private plane transfer to the resort is scheduled 4 times a week. This resort is annually open from March-August. Steep drops of 2000 meters in this area offer a lot of look at many pelagic with schools of many marine creatures such as barracuda, green and hawksbill turtle, and big eye trevally. The amount of corals are plentiful and unspoiled with sea fans growing up to three meters wide which filter planktons brought by the oceanic current. Those tourists who want to swim with sharks can do so with the plentiful species of large creatures here. Grey Reef, Scalloped Hammerhead, Leopard, and occasionally Silver Tip and Threshers, are the species that can be seen. This resort is PADI affiliated. The packages that are offered are daily boat dives and 60 meters of visibility gives divers the ability to see almost all there is to see.